Geologically speaking, Ballynoe House is situated in the middle of the Upper & Lower Old Red Sandstone (Devonian), so is about 370 million years old. The Devonian Period of the Palaeozoic Era lasted from 417 million years ago to 354 million years ago. Ardfield (“The Mountain”) is made of harder and younger rocks of Carboniferous age. The Carboniferous Period lasted from about 359.2 to 299 million years ago, during the late Palaeozoic Era. 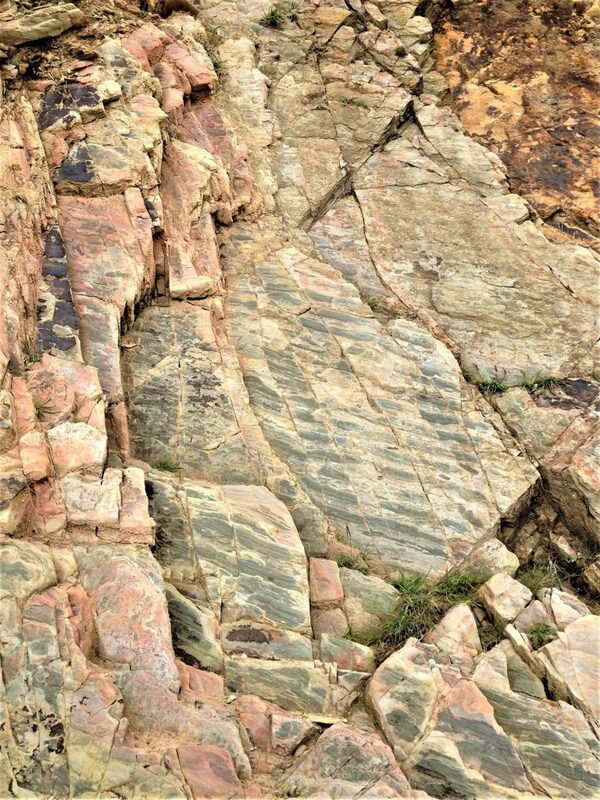 The beds of rock in West Cork are highly folded. The near-vertical beds provide dramatic erosional features along the coast. 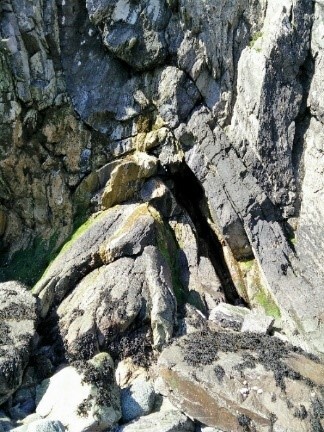 Tight folds can be seen in cliff faces, such as the one exposed at the western end of Sandscove. The unstable cliff at the eastern end of Red Strand doesn’t look much from a distance and is easily ignored when you stroll along the beach. 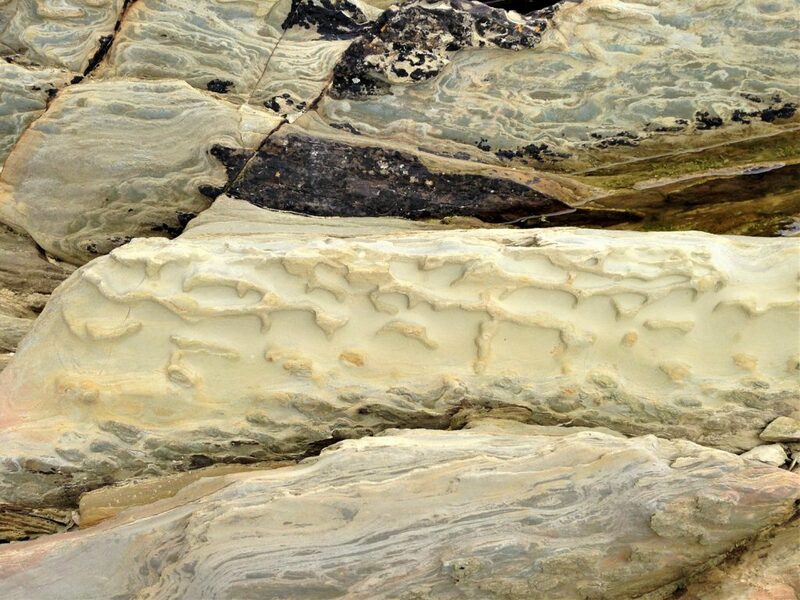 From a geologist’s point of view, the rocks exposed within the beach don’t look that interesting. With my geology hat on (rarely used these days) a mooch around the base of the cliff turned out to be far more interesting than expected. 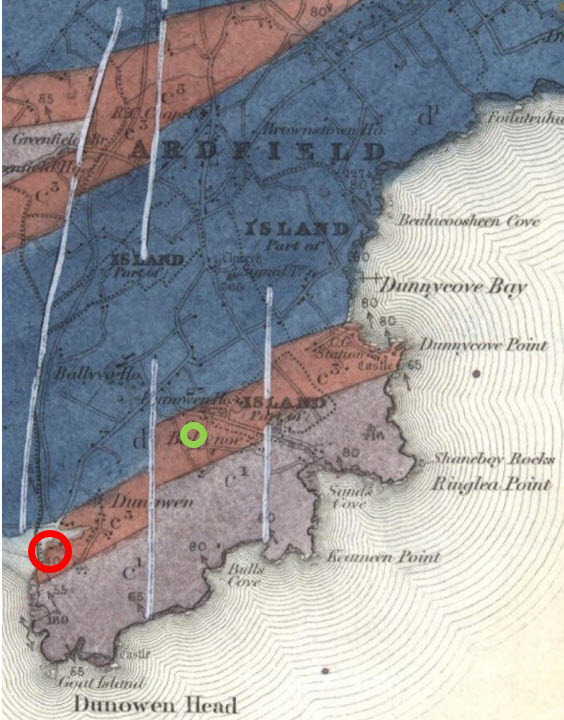 The section exposed along the beach is very close to the actual rocks that run below Ballynoe House (red & green respectively on the old geology map) and are part of the sequence belonging to the Upper Old Red Sandstone (Devonian). 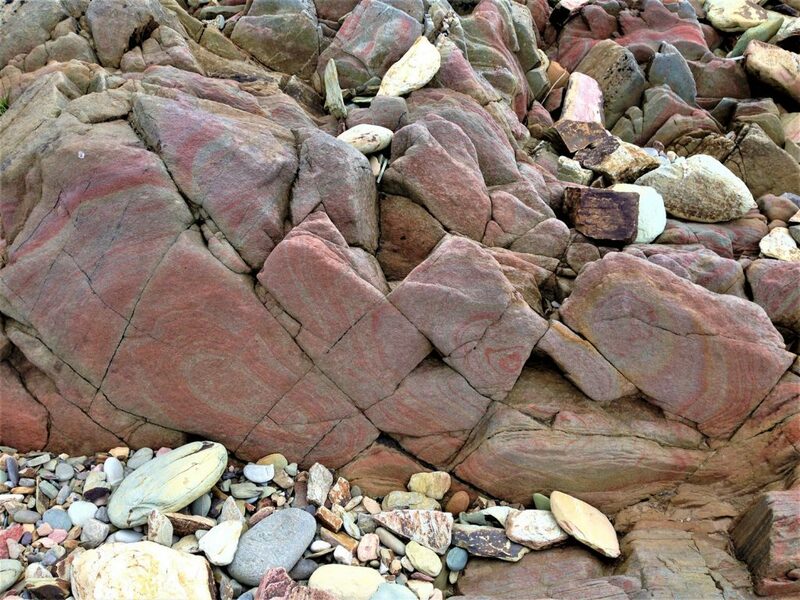 You can get a good insight into the depositional environment of the time, with red- and grey-banded sandstone (perhaps what may have partially contributed to Red Strand’s name) indicating alternating oxygen-rich and oxygen-poor water, and what appear to be trace fossils (possibly worm burrows). At a time when almost all life on Earth was in the sea, this appears to be alluvial (river), beach or tidal estuary. For the uninitiated, a relatively-recent mountain-building episode had created the Caledonian mountains, so this river was probably one of many running south off the mountains towards to sea. Some organic-rich staining can be seen in some of the rocks, which is interesting, as it was around this time that life was getting a foothold on land ahead of the famously-massive forests of the Carboniferous period. Perhaps signs a proto-forest had already been established. Nice to see 400 million-year-old ripples just a few metres from ripples just a few hours old. “The old red sandstone occupies the greater part of the surface of these districts. It extends into Kerry and Waterford and occurs in many other parts of Ireland. It is singularly barren of fossils as only a few traces of plant stems have been found. There had been outbursts of volcanic rock during the old red sandstone period. These have occurred on Bere Island, Dursey Island, and Cod’s Head. On Bere Island the old red sandstone grits have been altered in colour by the heat of the igneous rocks, being white instead of red. The igneous rocks are greenstone, both contemporaneous and intrusive. The old red sandstone is covered generally by carboniferous limestone. On Bere Island and other parts of these districts it is covered by carboniferous slate. The limestone was evidently made from the debris of coral reefs, and the remains of crinoids and other marine animals. Coral reefs are being formed at present in Bantry Bay, and in course of time would reach the surface were it not that coral sand is extensively raised for the purpose of manure. The thickness of limestone rocks implies the enormous lapse of time occupied in this formation. The carboniferous slates have been formed of the products of the destruction of various older rocks. On Bere Island igneous rocks occur in the carboniferous slate in the form of contemporaneous and intrusive felstone and felstone ash. At the same period volcanic action occurred in the neighbourhood of Allihies. By far the larger part of the surface of Ireland, from the South to Lough Neagh, consists of carboniferous limestone, lying sometimes on the old red sandstone, and sometimes on Silurian rocks. In the carboniferous rocks more than 500 species of fossil plants have been found, including ferns and gigantic clubmosses, also the wings of beetles, spiders, and other insects. Coal measures usually lie on the carboniferous limestone and form hills over 1,000 feet high. There are evidences of coal in Hungry Hill, but, unfortunately, the rest of the district is destitute of coal. It is probable a great coal field at one time overspread the carboniferous limestone of the whole country, but probably was swept away by the great glacial disturbance to which we shall now refer. There are numerous evidences of a glacial period when the northern hemisphere was subjected to a climate of the utmost rigour. The British Islands were covered by glacier ice. The Killarney mountains, and the ranges surrounding us, were literally smothered in ice which was several thousand feet thick. It is believed that subsequently a low submersion of the land took place. After the cold had passed away the countries were elevated, and England was re-united to the Continent, and Ireland to England. Many European animals, as elephants, hippopotamus, the red deer, Irish elk, etc., passed over to these countries, and some of those animals are here still, while the bones of others have been found in various parts.